Welcome to an online exhibition of the finest abstract paintings you’re likely to see, all by Don Van Vliet. It was Don Van Vliet’s visual art which initially inspired me to set up this website in 1998. My interest in Captain Beefheart’s music had drawn me to his 1994 Stand Up To Be Discontinued exhibition in Brighton which made an immediate and lasting impression on me. During its nine-week run, I went back again and again just to spend some time in the same room as these beautiful and striking explosions of paint and personality which bore their creator’s instantly recognisable humour, love of the natural world and his desire to do things entirely his own unique way. The intriguing word-play in the titles was also very reassuringly Beefheartian with many titles containing references or quotes from his past lyrics. Sometimes I think I love the paintings even more than the music. Other times I don’t really think about it. 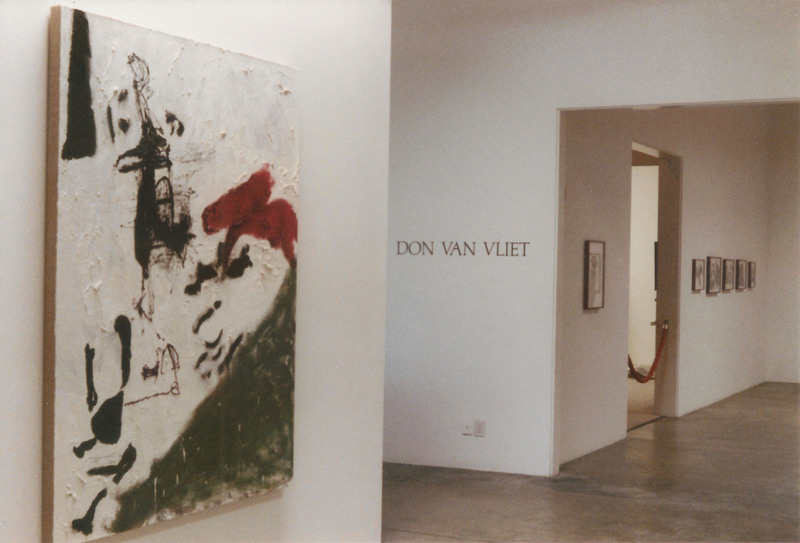 Many of Don Van Vliet’s paintings are available to view on this site. Just dive in or view a few favourites to start you off. You can read information about past exhibitions including reviews, essays, paintings featured and the availability of catalogues. We have reams of words about Don’s art from exhibition catalogues, newspaper articles and Radar Station exclusives. A few books have been published about Don’s art too. When there’s anything to report, our blog features art-related news updates. If you are interested in purchasing any of Don’s work please visit the purchase information page. Information is very sketchy at the moment – if you know more, please pass it on. If you have any Don Van Vliet paintings which are not featured here, please also let me know. The exhibition photo above was taken by Voot Zombo at the 1990 Fred Hoffman Gallery “Paintings and Drawings” exhibition. Many thanks indeed to Voot for sending it over.